Peel Hall was a manor house in the area of Little Hulton (this is an area south of Bolton and north east of Leigh). Sadly the Hall fell into disrepair, becoming a stately ruin that was demolished in the late 90’s.Peel Hall was constructed on the site of an ancient moated hall known as ‘Wicheaves’. In 1631 Adam Mort of Preston inherited Wicheaves and Smithfold from his father (also called Adam Mort). A new Wicheaves Hall was later built, and both the new and old Peel Halls along with Wharton Hall, continued to be used by the Mort family of the area. Thomas Mort inherited the Hall but died childless, as did his brother Richard. It was Richard’s widow Catherine, who lived in the house after her husband’s death. Catherine (the last of the Morts of Wicheaves) died in 1737. She is often refered to as the ‘best remembered occupant of the Hall’, mainly because her ghost was said to haunt the house and the grounds. She was known as ‘Madam Mort’ and it was under her orders that Madam’s Wood was planted and named after her. The plantation was a mixed woodland, chiefly of birch trees. It was carpeted with bluebells in the spring, and when Peel Hall became a Hospital (prior to being demolished) the hospital grounds were said to still contain the original bluebell bulbs. In her will of November 1st 1737, Catherine Mort left Peel Hall and surrounding land in trust for her nephew John Fletcher. He was to have the premises for life and should he die or refuse to live in the Hall, the Manor would pass to Sir Joseph Yates of Manchester, a justice of the King’s Bench. 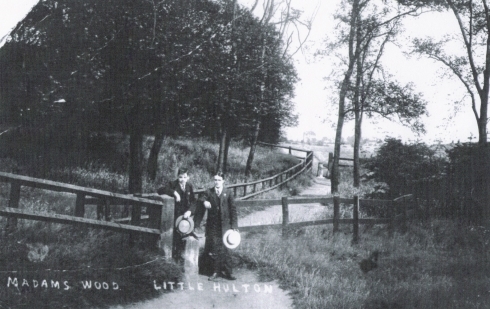 Madam’s Wood was purchased by Little Hulton District Council in 1920 and opened to the public in 1921. It has been reported, that the ghost of Catherine Mort is still a frequent visitor. On behalf of all female descendants from the Mort family, I sincerely hope that we do not have issues with ‘letting go and moving on’ and that haunting places is not generally high on our agendas. We apologise about the fact that some of our female ancestors did have a tendency to scare mere mortals with their spiritual activity but we believe that some of the living may well have deserved it’.